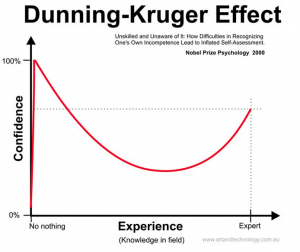 You come across the Dunning-Kruger effect a lot on the internet. It seems to be everybody’s favourite cognitive bias. I certainly like it a lot. I think it is easy to like, because it basically suggests that people who think they are super smart are probably not as smart as they think they are, and this is a very comforting thought. Unfortunately, it’s not only a comforting thought, but also a lazy thought. Just because most stupid people think they are smart does not mean that most of the people who think they are smart are actually stupid. Now, let’s have a look, shall we? First of all, the legend says: “Nobel Prize Psychology 2000”. This is indeed a legend. There is no Nobel Prize in Psychology. What Dunning and Kruger won is the Ig Nobel Prize, which is awesome, but not the same thing. The plot shows confidence in what you know as a function of how much you know. The curve starts at zero (if you really know nothing, then you are obviously not confident in your knowledge). Then it skyrockets up, illustrating that people who know very little think they are super smart. As more knowledge is acquired, confidence starts going down again (presumably as people start knowing enough to grasp how little they know). Then, as you move towards expert mastery, your confidence goes up again, but never to the astronomical levels of the know-it-all beginner. Makes sense, right? It’s also wrong. If you look at the actual data, it looks quite different. 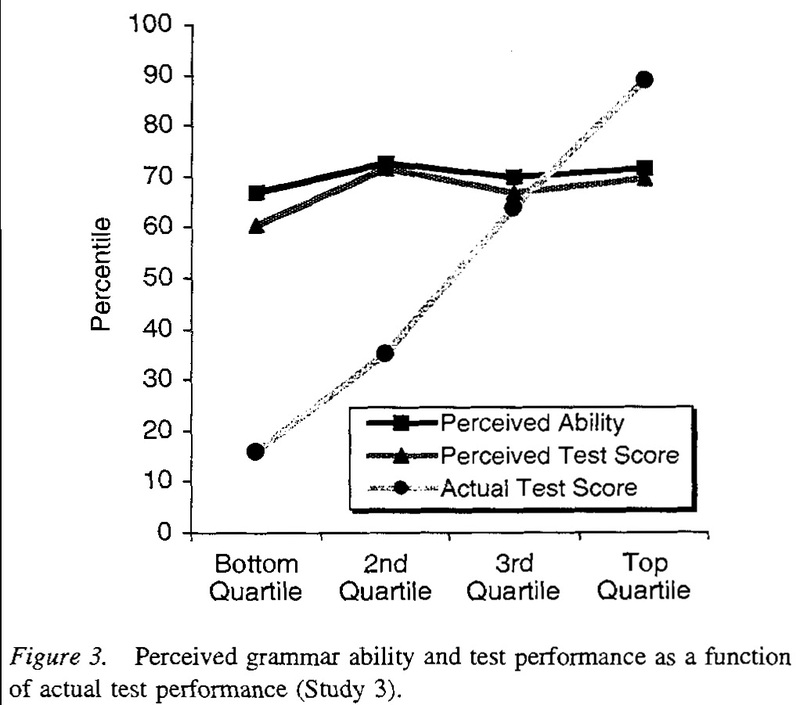 This is a plot from Kruger and Dunning’s actual paper (measuring confidence and actual skill in a test of grammar). So the actual data looks more like … well, more like a straight line almost. It’s a bit hard to tell, because there are no error bars, but to me, it seems like everybody (regardless of actual ability) is just saying: “Yeah, I guess I’m doing alright. 60th to 70th percentile probably.” Of course, this means that less proficient people actually overestimate their skill level, but it also suggests that more proficient people underestimate their skill level. I don’t see evidence for the claim that metacognition improves, it is just that with increasing skill (up to a point) you get closer to the level you always thought you had. It is still an interesting finding, but it is far less dramatic than most people seem to think. So let’s summarise: A lot of people like to cite the Dunning-Kruger effect, thereby displaying their knowledge of psychology (usually to prove some sort of point about people who think they are smart). In doing this, they often show questionable statistical understanding, use falsified plots, and reveal that they have not taken the half hour or so it takes to actually read the original research. But isn’t that often the case? People who know very little about a topic tend to overestimate their own expertise. This entry was posted in Uncategorized and tagged Education, Learning, science communication, statistics by melamelachan. Bookmark the permalink. On the other hand, if you do feel like you’re unworthy and horrible, you might be suffering from impostor syndrome. It’s a trap!